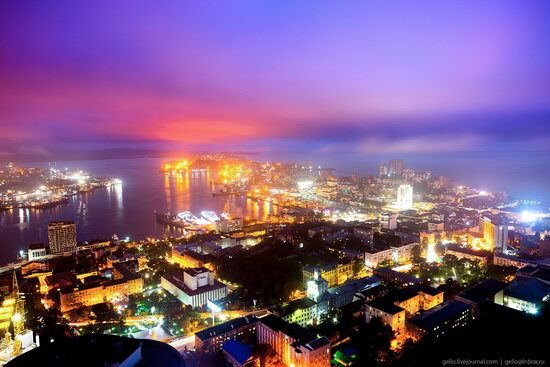 Vladivostok is a city with a population of about 600 thousand people and a major seaport located in the Far East of Russia. It is the administrative center of Primorsky Krai and the last station of the Trans-Siberian Railway. The city is located on the Muravyov-Amursky Peninsula and the islands in the Peter the Great Bay of the Sea of Japan. The military post of the Russian Empire called “Vladivostok”, which means “holding the east”, was founded in 1860. In 1880, it received the status of a town. Photos by: Slava Stepanov. 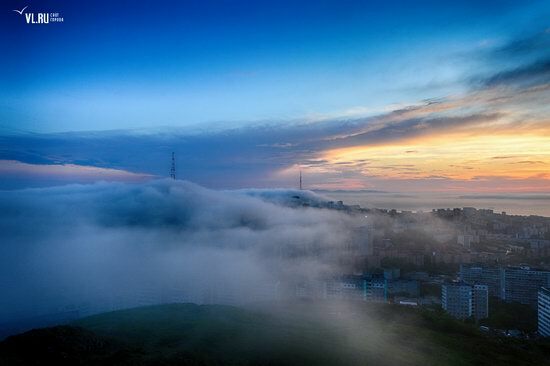 Vladivostok is a large city and seaport located in the Russian Far East, on the peninsula Muraviev-Amur and islands in Peter the Great Bay, Sea of ​​Japan. The climate in the city is monsoon. One of its characteristics is the formation of dense fog that can envelop the city for several days. Up to 90% of foggy days are registered from April to August. Russky Bridge is a cable-stayed bridge to the Russky Island across the Eastern Bosphorus Strait in Vladivostok. Construction of the bridge began September 3, 2008. It was the part of the city’s preparations for the APEC summit in 2012. 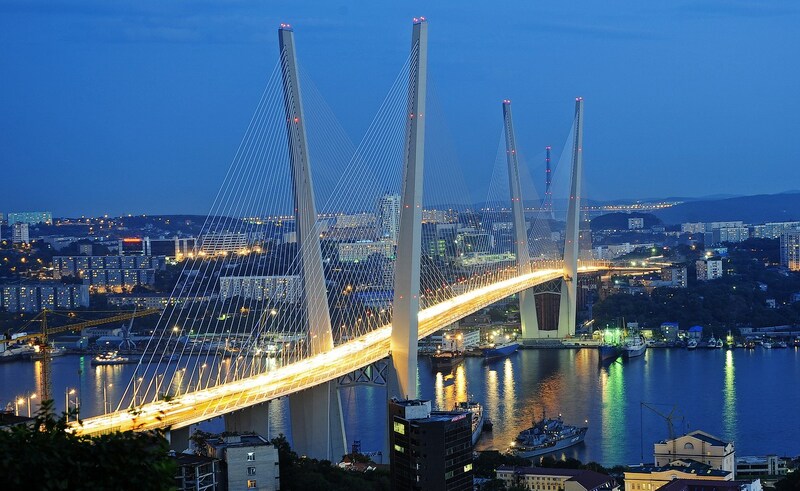 The Russky (Russian) Bridge is a cable-stayed bridge located in Vladivostok. The bridge connects Nazimov Peninsula and Novosilsky Cape on the Russky Island. Construction of the bridge started September 3, 2008 as part of the city’s preparations for the APEC summit in 2012. 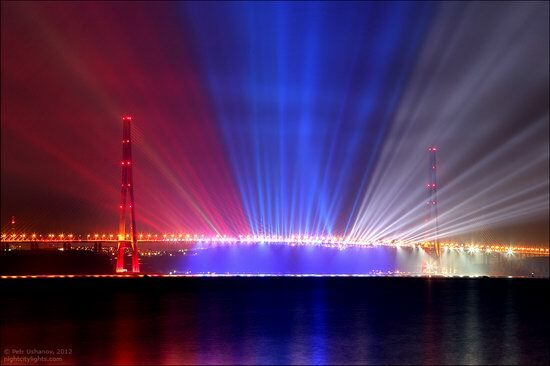 The bridge has the world’s largest span among cable-stayed bridges (1104 meters), and the highest pylons – 324 meters. September 8, residents and guests of Vladivostok could see beautiful light show prepared for the APEC summit. 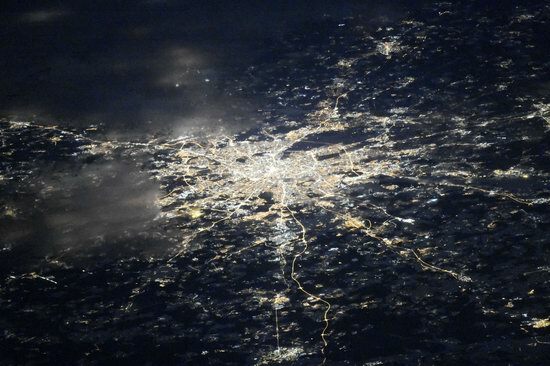 It was the largest light show in Russia this year. 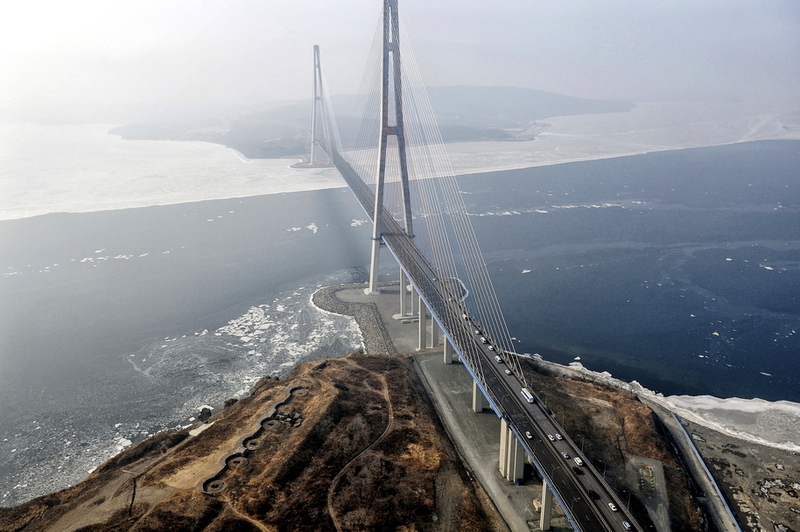 August 1, 2012 the bridge to the Russian (Russky) Island was opened to private traffic. 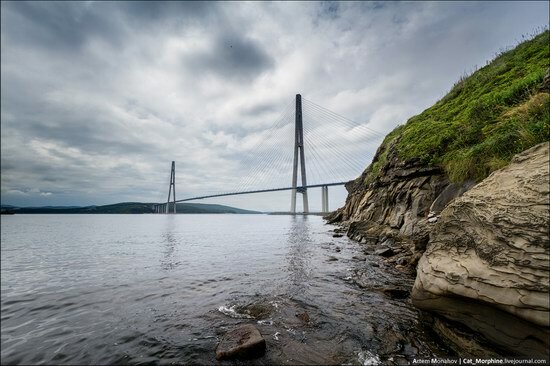 It is a cable-stayed bridge in Vladivostok, connecting Nazimov Peninsula with Novosilsky Cape on the Russian Island. The construction of the bridge began September 3, 2008 as part of the city’s preparations for the APEC summit in 2012. The total cost of the project including the access road to the bridge is about $ 2 billion. The bridge over Zolotoy Rog Bay is a cable-stayed bridge in Vladivostok. The construction of the bridge began July 25, 2008 as part of the city’s preparations for the APEC summit in 2012. 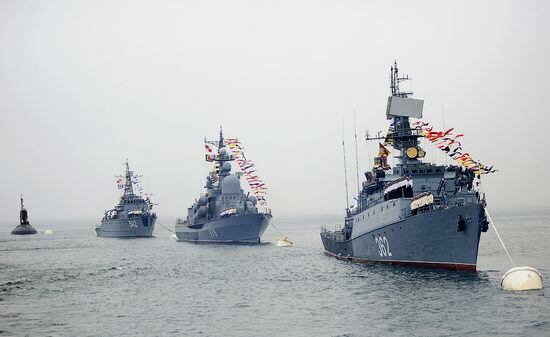 Day of the Navy is a memorable day in the Armed Forces of the Russian Federation. It is celebrated annually, on the last Sunday of July. The Navy Day is celebrated with military parades, military and sporting events, holiday concerts, all kinds of themed contests and quizzes. The next stage of combat training of units of the Marine Corps of Russian Pacific Fleet began in the new academic year. 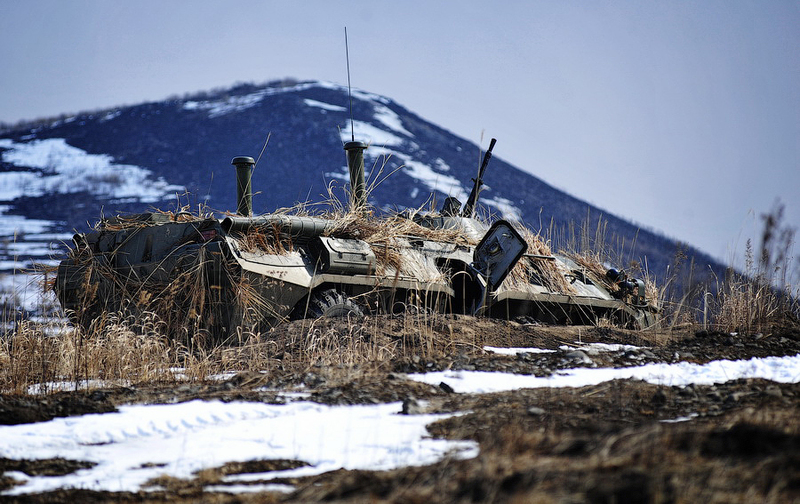 After winter combat training large-scale tactical exercises with firing began at the landing firing ground “Klerk” located near Vladivostok, the capital city of Primorye krai. The exercises involved 122-mm self-propelled artillery “Gvozdika”, 82-mm battalion mortars, antitank guided missile systems “Fagot” and infantry flame throwers “Shmel”.